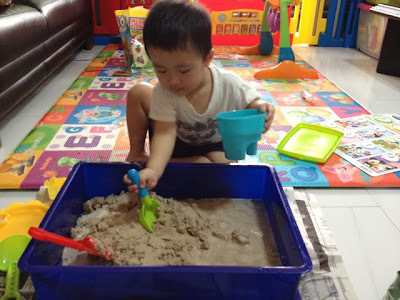 Our Lernen-Reise: Sandplay.. In the house! As the weather was... and still is nasty.. to top that up, IZ was down with brief fever last weekend, I've decided to let him play with my wet sand.. He enjoys playing with sand (minus my constant reminder of keeping the sand in the tray.. bla bla bla)..
After 15mins or so, he decided he's had enough! Think he would prefer to do it at the beach instead. I wish I was more supportive of him throwing sand all around.. but I didn't let my guard down.. Slap myself..